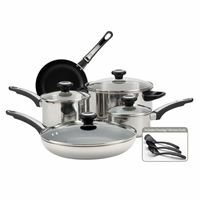 Polished stainless steel for beauty and durability. Permanent filter basket - no messy paper filters. Easy care - fully immersible and dishwasher safe. 9" x 13" Cookie Pan 10" x 15" Cookie Pan 11" x 17" Cookie Pan. 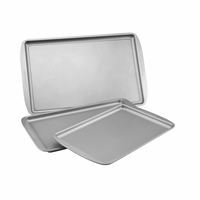 Bakeware has heavy guage construction that distributes heat evenly throughout the pan and reduces hot spots. 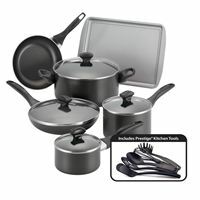 Inside/outside nonstick surfaces - food slides off and makes cleanup easy. Oven Safe to 450 Degrees. 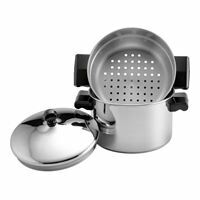 Heavy 18/10 stainless steel; 2-quart steamer fits inside 3-quart saucepot. Aluminum core in pot's base for even heating; base capped by stainless steel. 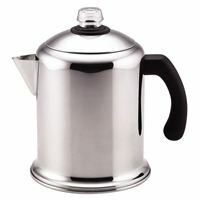 Thick, durable, rolled pot rims for drip-resistant pouring; tight lid. 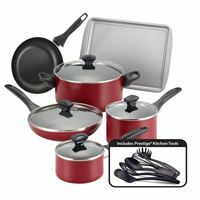 Handles stay cool on stovetop, oven-safe to 350 degrees F.
Polished stainless steel construction on the saucepans and Dutch Oven provide eye-catching style. 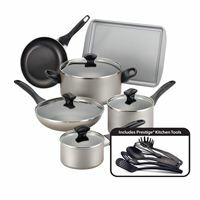 Aluminum skillets feature durable nonstick for easy food release and quick cleanup. Glass lids allow you to see inside without losing moisture or heat. 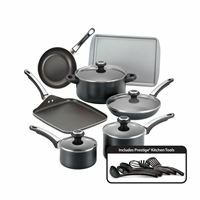 Comfortable handles with stainless steel inserts are strong and oven safe to 350-degree F.